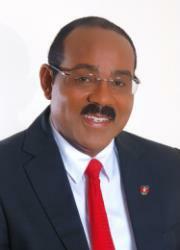 Prime Minister-elect Gaston Browne whose Antigua & Barbuda Labour Party (ABLP) won the June 12 General Election has told residents to brace for a ?new era? of national development. He told a news conference to accept victory and that he would deliver on promises made during the election campaign. Before addressing the crowd a teary-eyed Browne told a nationally televised address that he was grateful for the support he received from the public and it was evident that the people have spoken. He said the victory was not a time for gloating and that ?it would require a lot of hard work.? Up until press time, 14 seats had been declared for the party that endured 10 years in opposition before once again assuming the reins of power. The victory for the ABLP comes months after the ?lengthy? campaign period in which the team led by Browne took pains to ensure that the country was convinced that it was better off under his stewardship. Browne said his message is a symbol of hope to all residents, especially those who think they could not achieve great things because of their circumstances. The lengthy election campaign appeared to have paid off and today thousands of residents who placed confidence in the ABLP have something to celebrate. As his first act, the prime minister-elect declared a national holiday and asked the governor general to appoint Steadroy ?Cutie? Benjamin as attorney general. tfl0CC I loved your article post.Much thanks again. Much obliged.